Rifleman(RFN) Jaswant Singh, number 4039009, was serving with the 4th Battalion of the Garhwal Rifles.On 17 November the battalion was subjected to repeated Chinese assaults. A Chinese medium machine gun (MMG) located at a vantage point close to the A company lines was proving to be a dangerous menace. Jaswant, Lance Naik Trilok Singh Negi and RFN Gopal Singh Gusain went after the Chinese MMG and after approaching within 12 metres threw grenades at the bunker and charged it, killing a number of Chinese and capturing the MMG. Jaswant took the MMG and began crawling back towards the Indian lines but he and Trilok were fatally hit by Chinese automatic fire when nearing safety.Gopal Gusain was wounded but managed to drag the MMG into the Indian post. This turned the course of the battle and the Chinese retreated, leaving some 300 dead behind. Jaswant was awarded the Maha Vir Chakra (posthumous) and Trilok and Gopal the Vir Chakra. A popular and widely-disseminated local story goes as follows : It was the final phase of the Sino-Indian War in November 1962. Even as his company was asked to fall back, Jaswant Singh remained at his post at an altitude of 10,000 feet and held back Chinese soldiers for three days assisted by two local Monpa girls named Sela and Nura (in some versions one or the other girl is mentioned). Some sources say that he was escorted by one lady of the local village named Bum La during the War. They set up weapons at separated spots and maintained a volume of fire that made the Chinese think they were opposed by a body of troops. Finally the Chinese captured the man who was supplying rations to Jaswant and he revealed to them that they were opposed by only one man.They attacked in force,Sela died in a grenade burst, Nura was captured and Jaswant supposedly shot himself with his last cartridge when he realized that he was about to be captured. It is alleged that the Chinese cut off Jaswant Singh’s head and took it back to China. It is claimed by some that he killed more than 300 Chinese Soldiers in the war. However, after the ceasefire, the Chinese commander, impressed by the soldier’s bravery, returned the head along with a brass bust of Jaswant Singh. The bust, created in China to honor the brave Indian soldier, is now installed at the site of the battle. Jaswant Singh’s saga of valor and sacrifice continues to serve as an inspiration to all army personnel posted in this sector. He has become a ‘Baba’, a saint. At the spot where he fought,a small temple has come up with a bust of his and many of his personal effects. 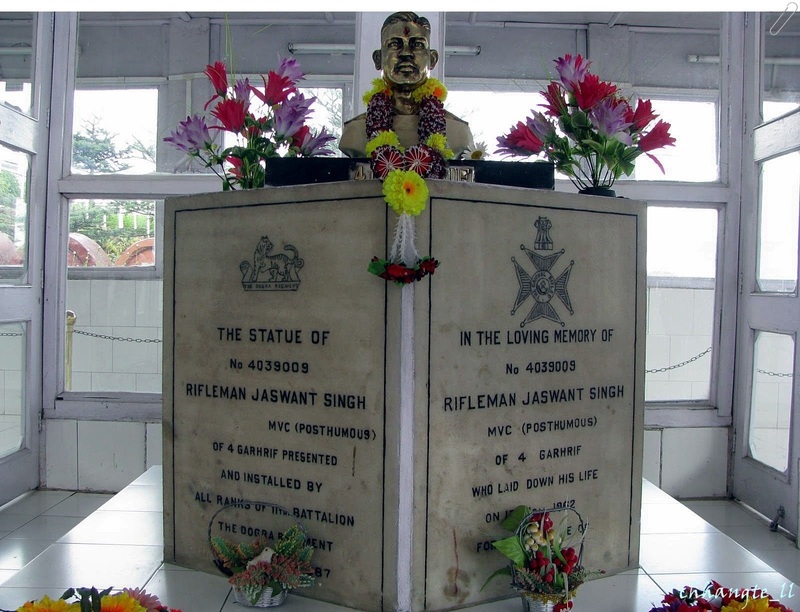 A marble plaque commemorates him and 161 other men of his battalion who died in the battle of Nuranang, which was awarded to Garhwal Rifles as a battle honour.This shrine known as Jaswant Garh is between Se La and Jang. All Indian Army personnel passing by this route from General or a jawan, make it a point to pay their respects here.So do civilians. Jaswant is treated as if he is alive, his boots shined and his uniform and accoutrements cared for by Army personnel posted at the shrine. He has received all his promotions in time, and has reached the rank of Honorary Captain. JASWANTGARH (TAWANG): He is served bed tea at 4.30am, breakfast at 9am and dinner at 7pm. Five Army soldiers are at his service round-the-clock. There are no chores to be done. Life couldn’t be more comfortable for ‘Baba’ Jaswant Singh Rawat… but for the fact that he is no more. Baba was captured by the Chinese way back in 1962 and hanged at the spot where his memorial stands today. No soldier, not even a general, is allowed to move ahead, towards the Sino-Indian border, unless he pays his tribute to rifleman ‘Baba’ Jaswant Singh Rawat. Baba of 4 Garhwal Corps who, along with two other soldiers, held on to this post – 21 km from Sela Pass near Tawang – for 72 hours, orchestrating a counter-attack on the Chinese forces before he was severely injured by enemy bullets, captured and then hanged. Baba Jaswant Singh has attained the status of a deity on the Sino-Indian frontier. A temple has been erected in his memory and the Army has posted five soldiers for the upkeep of his memorial. Rajesh Kumar, however, has one grudge. The Baba still “lives” without electricity. “We have a generator set which we use for sometime in the evening for putting on the lights at the temple and also in our huts,” he says, hoping that the state government may someday provide a permanent electricity connection here. Incidentally, Rifleman Jaswant Singh Rawat was awarded a Maha Vir Chakra (MVC) posthumously, something the main Opposition in Parliament, BJP, is not happy about. “He was the last resistance the Chinese Army faced when they invaded Arunachal Pradesh, yet Jaswant Singh was awarded only the MVC,” says BJP MP Kiren Rijiju who plans to raise the issue of Jaswant Singh getting the highest battle honour, the Param Vir Chakra. In the battle against Chinese in November 1962, Rawat and two other soldiers were instrumental in killing 300 Chinese soldiers against two casualties from the Indian side. The 4 Garhwal Rifles was awarded battle honour Nuranang, the only battle honour awarded to any Army unit in the Sino-Indian war of 1962. This entry was posted in Biosketch, History, Nation and tagged Indo-China War Hero, Rifleman Jaswant Singh Rawat, War Heroes on November 3, 2012 by arisebharat.